You know what’s similar between homework, gaming, and a Disney Movie? Your children, and their laptop. For homework and gaming, a bigger screen size (measured diagonally across the screen) would serve your child the best. Conversely, if you want a laptop which accompanies your child as he grows up, the below mentioned Dell Inspiron 15 3000 Series would suffice. Portability is another issue, as your child would inevitably be carrying their laptop in a backpack, so choose a device which weighs less. Then there is storage. And it is a no-brainer that children do not need much storage, therefore a 320GB hard drive should be your upper limit. Look at the abovementioned comparison table of the top ten best laptops for children, and you’d only see two operating systems: Chrome and Windows. Why’s that? Well, we decided to rule out any Apple laptop because they aren’t available for less than $500, which is a benchmark for adult laptops. Similar is the case with Mac, whose most inexpensive laptop – the MacBook Air – won’t come for less than $999. Therefore, as long as you aren’t ready to break the bank, both the Apple and Mac laptops aren’t worth it. With Apple and Mac OS out of the system, we are left with two options: Windows and Chrome OS, with the latter being Google’s operating system. You might never have used it, but since it allows its users to run apps directly from the Google Play Store, your child would love it. More importantly, last year in November Microsoft made the MS Office available for Chromebooks to download via the Google Play store. Therefore, if you aren’t buying your kid a smartphone due to its shenanigans – but want them to play games once in a while, while also writing their homework in MS Word, Chromebooks won’t weigh heavily on your pockets. Though kids have been using Windows for years, it is the recent addition to the Windows – the Windows 10 S version – which has made this operating system more useful for kid-oriented laptops. Aimed at the education market, Windows 10 S is a lightweight version of the full-fledged operating system. More importantly, Windows S laptops are restricted to run apps which are only available at the Microsoft store, so as to provide better security. It means you could block games and apps based on their ratings. And when your child grows up and become more responsible, Windows S laptops give you the freedom to upgrade them to their full version, and all the limitations would be removed. Finally, if you have still trouble deciding, consult your child’s school. Most schools nowadays have specific software which only run on Windows, hence you won’t have to make a decision. Otherwise, you might want to take a good look at Chromebooks. Despite the fact that this laptop has a price which competes with entry-level Windows devices, the Asus Chromebook Flip still provides the look and feel of a premium machine. Compare it to any other plastic laptop, and its long battery life, beautiful screen, and backlit keyboard make it more attractive. Starting from its design, Asus has provided the Chromebook flip with a body which is all glass and aluminum, much similar to that of Apple MacBook Pro – a device which costs three times as much. Complementing its body is the lid which rotates 360 degrees so that your child could use the Chromebook flip in Laptop, Tent, Stand, or Tablet mode. As a result, the last three modes would provide your kid with an unobstructed access to the laptop’s touchscreen. What’s more, since the laptop weighs only 2.43 pounds and measures 0.53 x 11.96 x 8.26 inches, your kid would have no trouble using it on his couch, on a study desk in his room or in the school, as well as on the tray table of an airline. The screen, which is 12.5’’ full HD, is undoubtedly the highlight of this model. Not only would it display bright and accurate images, but it also has a wide angle so that you could share it with multiple friends. Equally important is the touch sensitivity whose quickness makes the device fast enough for most online games, should your child feels like playing them. Also, since the Chrome OS now features a tablet mode after recent updates by Google, the Chromebook Flip would automatically switch into the tablet mode once you turn its screen beyond the 180-degree mark. And if your child like listening to music, the stereo speakers on the right and left side panels of this device could easily fill a medium-size room with clear and crisp music. The backlit, full-size keyboard would be comfortable to use even during extended typing sessions. It also has a one-piece, wide touchpad which is extremely responsive to support multi-touch commands without breaking a sweat. Looking at its storage, and the Chromebook Flips features 64GB of eMMC flash storage and 4GB of Ram. The RAM – which would rival any of that found in a Windows laptop – would power the device enough to keep several tabs open at the same time. As for the storage, well, it is definitely on the shorter side especially when you compare this device with its Windows counterparts. That said, the money which you’d save on this device you could spend on extending its storage, as it provides a microSD card slot which could expand the local storage up to a considerable 512GB. What’s more, in the package, Google offers 100GB of cloud storage for two years. As for its processor, the Chromebook has an Intel Core m3-6Y30 processor which offers Intel HD Graphics, which won’t leave you wanting for better performance. For instance, during testing, we were able to stream three 1080p video streams without any hitch while opening half a dozen tabs to access heavy websites like Yahoo Mail and wired.com at the same time. Finally, we found the battery timing of this machine as simply remarkable. It lasted just under ten-and-a-half hours on our rundown test, which is a bit longer than what you get from similarly priced models from other manufacturers. The one major concern most of its users (and potential users) have about this model is its price tag. For, for a Chromebook, the Flip is very expensive. The Asus Chromebook Flip (C302CA-DHM4) deserves your attention if you want something more than a run-of-the-mill Chromebook, and are also willing to pay over the odds for it. That said, it’s still priced in line with entry-level Windows devices, which makes this device an attractive proposition. The Asus Transformer Mini (T102HA-D4-GR) is a detachable, entry-level Windows tablet that comes with functional accessories including a pressure-sensitive stylus and a keyboard cover, which costs extra with a few other laptops that offer it. With magnesium-aluminum alloy supplementing its glass body, the Asus Transformer Mini gives off more of a premium feel than other similar priced laptops that are plastic-clad. The back panel has a matte silver color which complements the gray pattern of the keyboard cover, and you could also get a bright orange cover on demand. The system weighs a paltry 1.18 alone and once you connect the supplied keyboard cover, its weight would tilt to 1.75 pounds, which is still manageable in your child’s backpack. And as suggested by its 0.5 by 10.2 by 6.7 inches dimensions, the frame of this machine won’t occupy much space, so you could stow it in a small bag with ease. To tilt the keyboard into an easy-to-type position, this system has a two-stage magnetic latch. That said, we found the keyboard keys to be a bit closely placed and on the tinier side, which might make typing a bit inaccurate at first. Similar is the case with the touchpad which suffers from a bit of lag. As for its 10.1-inch screen – which is a bit on the shorter side even for a kids’ laptop – it features a 1,280-by-800 resolution, which means that while playing 720p or 1080p videos, the laptop would have to scale them down. Fortunately, the screen is bright and makes color to pop, so YouTube or Netflix videos would look good, though I won’t browse images in a badly-lit room with it. At the price range in which this device is available, it offers a lot of very good connectivity options. Apart from the microSD card reader which is common in laptops nowadays, it has a micro USB port, a micro HDMI port, one opening for a headset jack, plus a full-size USB port. Wireless connections are 802.11ac Wi-Fi with a Bluetooth 4.1 which means that dual-band connectivity and faster transfer speeds are guaranteed with this machine. A round fingerprint sensor on its back panel which – despite its awkward placement as you’d have to reach around the laptop to use it – makes it easy and secure to log into the Windows. Just like the abovementioned Chromebook, 4GB of RAM is on offer with the Asus Transformer Mini, though it does better on the storage count by providing 128GB of eMMC flash storage. During our testing, we were able to open seven tabs simultaneously – with two of them browsing HD videos – and the laptop didn’t stutter. As for its processor, Asus has equipped the Transformer Mini with a quad-core Intel Atom x5-Z8350 processor which has integrated Intel HD Graphics. While these graphics won’t make this laptop suitable for multimedia power users, for a school-or-college student, they would be more than enough. Compare it with the abovementioned Chromebook Flip, and only then would you be able to seriously appreciate the just about 14 hours battery timing of this device. That means that if you are going to spend a considerable time away from the power adapter, the Asus Transformer is what you need. As suggested earlier, the awkward placement of the keyboard buttons – which were also tiny for our liking – makes typing on this laptop difficult, at least during the initial stages of its usage. If you have your heart set on a Windows device, the Asus Transformer Mini T102HA offers an excellent choice at a modest price tag. With its nice display, strong connectivity options, and a huge battery life, this laptop merits your attention. Running Windows 10 S – which has recently been turned from an operating system into a ‘’mode’’ – the Asus VivoBook W202 is aimed at parents and teachers searching for a sturdy yet inexpensive laptop for the children. Yes, the lower price tag means some notable omissions from this device – as it doesn’t have USB-C port – but on the whole, this device would suit kids well. If you ask us, we’d point to durability as this laptop’s signature feature. All the edges and corners have rubber linings to reduce any impact which this laptop might receive from bumps and knocks, which means that Asus’s boast that it could survive high pressure isn’t way of the mark. Another claim which Asus makes about this device – and which we found to be true during our testing – was that its keyboard could survive 2.2oz of water. When we dropped water onto it, the water droplets form beads so we were able to rub them off like dust, with the keys still functional. It weighs 2.6 pounds – a weight tad too heavy for its size of 0.89 by 11.6 by 7.9 inches. The screen has a wide bezel on all four sides, and the keyboard is a bit on the smaller side, though kids with their small fingers would have no trouble operating it. Opening the lid would reveal an 11.6’’ matte screen which would provide two benefits. First, unlike PC desktops, the screen doesn’t allow the glare from the fluorescent ceiling lights. Second, since its resolution is on the lower side (1,366 by 768), you would get a glossy, vibrant display off it. Just below the keyboard, you’d find a Windows Precision Touchpad on the Asus VivoBook W202 which would not only reject accidental palm contact but would also accept multi-finger gestures at the same time. And while it doesn’t make any difference to its performance, the startling sound which the pad makes on clicking might perplex your ears. For connectivity, the VivoBook offers an 802.11ac Wi-Fi, Bluetooth 4.1, and VGA webcam. While the first two are without fault, the VGA webcam suffers from a significant video lag which you won’t be able to overlook. On the right and left edges of the laptop are located two speakers with grilles which are powerful enough to full a middle-sized room with sound. And while it does offer the usual connectivity features – HDMI port, USB 3.0 port, SD card slot, and a headphone jack, the absence of USB-C connector is glaring. 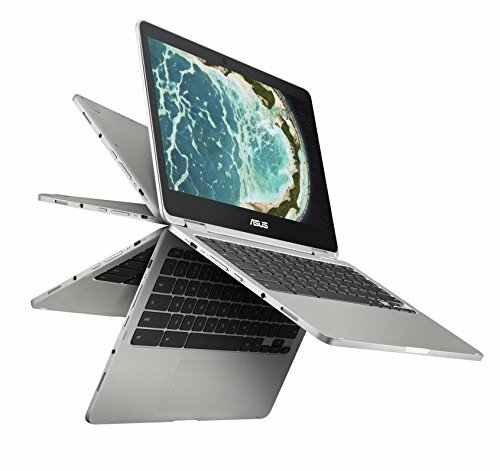 Just like the Asus Chromebook Flip, the Asus VivoBook W202 offers 4GB of RAM and 64GB of eMMC flash storage memory. Fortunately, there is another 4GB of memory provided on this unit, which should be enough to store homework and assignments for your kid. As for its processor, Asus has gone with the Intel Celeron N3350 CPU, which surprised us with its speed. Put simply, it means that even if you open multiple tabs at the same time, with some of them browsing HD videos, the laptop won’t freeze. During our testing, we were able to get more than 13 hours from the W202 in a single, full charge. Our test also involved playing a video file on loop at 60% screen brightness. 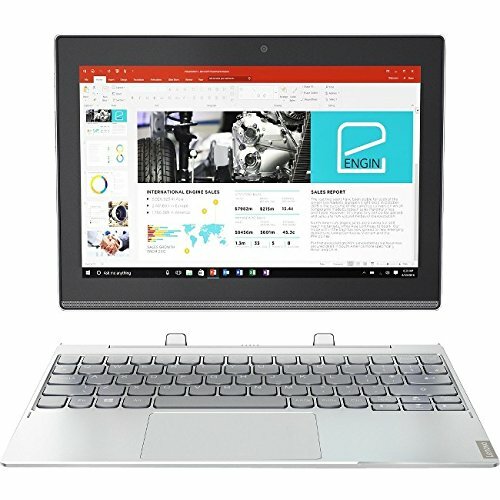 Since kids would most likely use the W202 for either note taking in the glass or for homework at home, this laptop would survive both a full day of classes as well as a long night of studying in a single charge. Using Windows 10 S as the operating system of this device has proved to be a double-edged sword for Asus. Where at one end it keeps your child safe, it also limits the functionality of this device by only allowing apps from the Windows store, on the other. The Asus VivoBook W202 is a rugged laptop which comes at a decent price and offers a solid set of features. As long as your child isn’t trying to write code on it, this laptop would pack enough power to meet his needs. Look at it for the first time, and the tablet and keyboard of this device are so well-integrated that you may not even know that the IdeaPad Miix 320 is a detachable 2-in-1 unit. 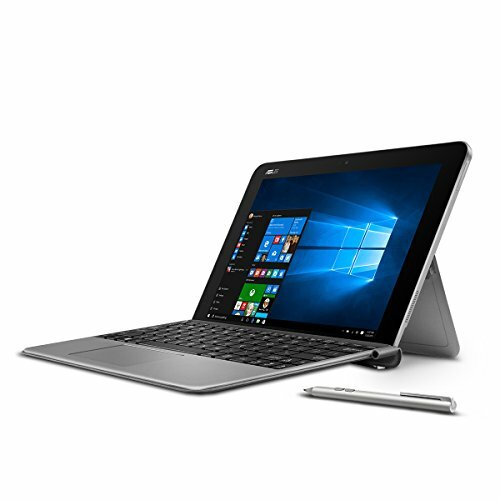 It is a Windows 10 laptop which you could transform to a 10’’ tablet merely by removing its keyboard which is magnetically attached to the screen. And as its price tag might tell, it’s best limited to light-duty tasks. Though it isn’t as lightweight as the abovementioned Asus Transformer Mini – which weighs a paltry 1.75 pounds, the 2.2lbs weight of the Miix 320 still makes it lightweight and small. It has a sturdy matte silver frame which has all the traits to lead you to believe that it was only a laptop. However, since it is a detachable hybrid, a hinge above the keyboard portion – which has two magnetized tabs – would connect it to the screen and hold it in place. Swivel the laptop’s screen in the hinge, and you could easily adjust its viewing angle to 125 degrees. And while the screen would easily detach from the keyboard on minimal pressure, you won’t be able to accidentally detach it. As for its screen, its 10’’ size means that it is a bit on the shorter side, even for a kids laptop. Fortunately, Lenovo has made up for this ‘’shortcoming’’ by providing the Miix320 with two cameras. The front camera is 2MP for selfies whereas the rear camera is 5MP for conventional shooting. Starting from its keyboard, and Lenovo has made full use of the 9.8’’ width of this device by providing it with full-sized letter keys. Though at first, your typing experience won’t be comfortable – ours wasn’t – with time you’d get used to it. Luckily, the touchpad proved to be responsive, with its bottom- right and left-click zones responding to a comfortable pressure. The Miix 2 features a 1,200 by 800 resolution with an aspect ratio of 16:10, which means that it provides more space for MS office documents. The screen is adequately bright whereas the sound system is enough to fill a small-sized room. One feature which we liked in particular about this device was its physical volume-control button. Though you can control the button from the icon when using it as a laptop, its button is a very good option, especially if you are going to use the 320 in its tablet mode. Apart from the volume control button, the left side contains power socket and an on/off button. On the right side, there exists a tiny hole for headphone socket, built-in mic, mini HDMI port, and a USB-C port. Beneath the hinge is a microSD card slot to increase the storage of this device. The combo of integrated Intel graphics and the Intel Atom x5-Z8350 processor makes this device most suited for emails, documents, web surfing, and media consumption. And while it won’t allow you to do video production or run a photo studio, the Lenovo IdeaPad Miix 320 could still run Photoshop, a rarity for budget laptops out there. The juicy part, however, lies in its storage. Despite offering the same 4GB of RAM which every budget-laptop-worth-its-salt provides nowadays, it provides a considerable 128GB of eMMC flash storage – twice as much as the Asus Chromebook Flip mentioned above. Add to this considerable storage the fact that it uses Basic Windows 10 – which is known for its universal compatibility, and your child won’t be disposing of this device anytime soon. As we have come to expect of budget laptops that they provide decent battery timing, the Lenovo IdeaPad Miix 320 didn’t disappoint with its 13-hour battery timing. As suggested earlier, the fact that the Miix 320 has a cramped keyboard might not fit too well with some of its potential buyers out there. Boosting a long battery life at a low price, the Lenovo IdeaPad Miix 320 has all the features to make it ideal for a kid’s usage. Add to this its detachable hybrid, a sturdy feel and brilliant magnetic connection, and there aren’t many loopholes in this device capable of denting its appeal. The Dell Inspiron 15 3000 Series is a budget replacement of the desktop sitting on your computer. Obviously, it doesn’t offer breathtaking speed at this price, but what it does offer is a whole terabyte of storage. The Inspiron 15 features a no-nonsense design, with its all black plastic complemented by a matte textured finish. Fortunately, the laptop’s edges are covered with a glossy look to add flair to its appeal as well as to give this budget laptop a sharp look. Turning our attention to its screen, and despite offering an above-the-odds 15.6’’ display for the price, it offers a below-the-odds 1,366 by 768 resolution. It means that you won’t get full HD videos with this machine, though Dell tries to make up for it by providing it with touch support. One thing which we won’t recommend doing with this laptop is applying pressure on the hinges, though. They look flimsy which means we won’t recommend opening/closing the lid multiple times in quick succession. Look at the connectivity features on offer, and you’d note that Dell has undoubtedly employed some cost-cutting measures on this count. For, while costing more than any device mentioned above, the Dell Inspiron only offers Bluetooth 4.0 (Lenovo Miix 2 offered 4.1), though it uses the latest 802.11ac Wi-Fi which means this laptop is ill-equipped to deal with a dual-band router. On the upside, there are quite a lot of port offerings with this machine. On the left edge are a USB 3.0 port, an HDMI port, and an SD card slot. On the right, you get a DVD drive (a rarity for budget laptops), two USB 2.0 ports, plus a headset jack. Hence, apart from slightly old Bluetooth protocol, it has a pretty decent feature set. Undoubtedly, it is the 1TB storage of this device which was one of the reasons why we included it in this article. For perspective, NONE of the abovementioned laptops come with as much built-in storage as this one. So, if you want a laptop which won’t require any additional storage options anytime soon, the Dell Inspiron 15 3000 Series is what you need. Performance-wise, this device has been equipped with a core i3 processor, integrated Intel HD Graphics 4400, and 6GB of RAM memory. It means that while it won’t provide super-fast performance, the Inspiron won’t let you suffer from hang-ups or freezes either. The Inspiron 15 offered a battery timing of just over 8 in our test. Compare it with other Dell products – particularly the Inspiron 17 which has a battery timing of 5hours – and this battery looks pretty good. However, compare it with notebooks in this review, and you won’t find the battery timing to be as alluring. Compare it with other devices in this article, and you’d know that the Dell Inspiron 15 offers reduced battery timing and less resolution. 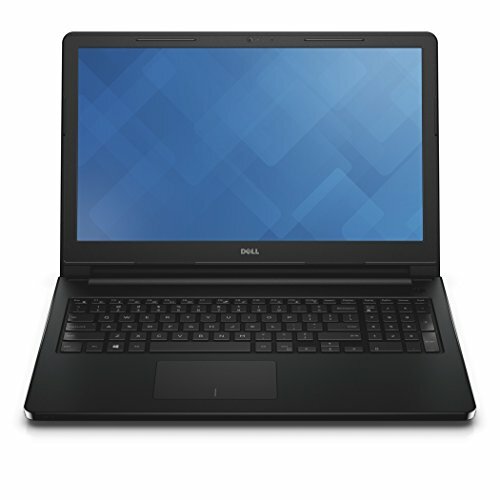 If your kid isn’t going to spend the whole day without their laptop’s charger – and if they aren’t too fond of games either, you could overlook the glaring shortcomings of Dell Inspiron 15 3000 Series (3558) in favor of its decent feature set and affordable price tag. For parents out there who think only Chromebook OS provides budget laptops these days, Acer, which has provided some great Chromebooks itself, dares to disagree with its Swift 1 Laptop. This device provides the full Windows 10 Home experience and that too at an entry-level price. As you’d immediately recognize by looking at its brushed metal keyboard, Swift 1 means business with its design, with no sign of the poor materials or generic bulky machines which are typically available in this price tag. Though there is still a lot of plastic on show, Acer has given considerable thought to the feel of the laptop by providing it with a garishly bright color, hence positioning it as a trendy, budget workhorse. So the sober approach which is typically associated with Acer machines is nowhere to be found in this case. Lift its lid, and the Swift 1 would welcome you with an XPS 13’’ matte screen which has a medium-thick bezel around it. More importantly, it features a Windows Hello fingerprint reader right where your palm rest would lie. Though small, the fingerprint reader is an appropriate press-your-finger instead of the age-old swipe-the-finger type. One warning before we move on to the next section: the keyboard is a magnet of fingerprints, so its sleek appearance would be replaced in no time with a grubbier patina. Worse, with a bright light shining on it, the fingerprints would become more visible. Away from the build-quality, the connectivity options offered by this device are all world class; On the left is a key-lock, an SD card slot, and a USB 2.0 port. While on the right you’d get an HDMI port, two USB 3.0 ports, a USB-C Port, and an audio jack. More importantly, you’d get an 802.11ac Wi-Fi with this model which would be more useful if you have a dual-band router at home. The sound from the speakers mounted on the laptop’s bottom is slightly muted, even when you turn the volume up to 100percent, and also flattens vocal tracks. Fortunately, as suggested by the ‘’Skype for Business audioconferences’’ sticker on its palm rest, the Swift 1 has a better talk-quality. Similar quality is on offer with the front camera webcam – as there is NO back camera – which provides well-focused and sharp images. One particular bugbear which we noticed about this model was its storage. Yes, the 64GB of eMMC flash is better than what most devices offer in the package, but it is what it the Swift 1 does with that storage which was surprising to us. For, be it fill copes or installs, we found them to be painfully slow, and guess what, also encountered multiple copy errors during our testing phase. Worse, once you install Windows and Office for your child, only 40GB would remain free. To its credit, Acer offers an identical Swift 1 with 128GB of eMMC flash, but the fact that it costs $70 extra tells us that you should purchase an SD card instead. And while we are not going to recommend Swift 1 for video editing, its Pentium N4200 processor has an exciting number of cores (four) for the price. Yes, your child would need some patience to run his or her games on the machine, but the fact that it would run them makes the Swift 1 an interesting prospect. You might associate its name with a sprinter, but the Swift 1 has a battery which would last a marathon. For, during our battery test, we were able to garner just under 13 hours from this device. Its keyboard isn’t backlit, and the 64GB of storage which looks impressive at first would be reduced to only 40GB once you install Windows and MS Office, two features that are a must-have even for kids’ laptops. 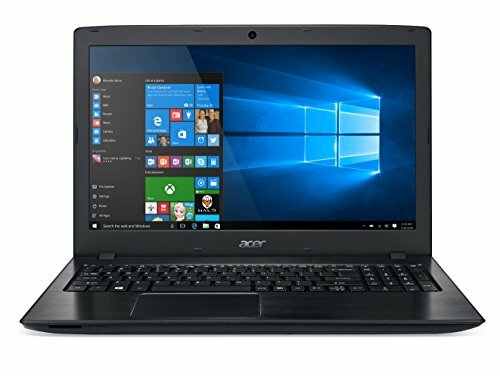 What’s the best laptop that you could get for under $400? Acer Swift 1 builds a strong case to be the best laptop in this case as, despite its low storage space, it boasts great battery life and has features like the Windows Halo Fingerprint reader to lure potential customers. If you want a full-fledged Windows laptops that could do everything, most of the times you have to pay the big bucks. 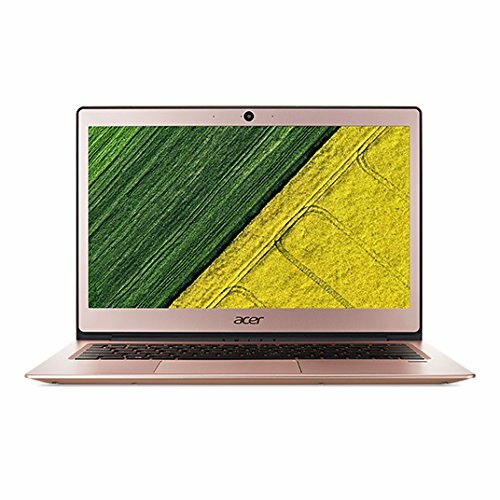 However, with the Acer Aspire E15, which offers solid features like Core i3 power, colorful HD 1080p display, there is a device which could do it all and won’t cost you to rob a bank either. As its price tag might betray, the shell of the E15 is entirely plastic, though a cross-hatched pattern on the black lid does well to cover it. Fortunately, the deck is all sturdy metal, with the bottom having rubber grips to withstand the impact of falls. This addition has made the notebook a bit bulky – it weighs 2.39kgs, but it has undoubtedly made it durable and solid as well. Appearance wise, you’d get a full 15.6’’ HD display which offers an impressive 1,920 by 1,080 display, and the LED is also backlit. That said, while it won’t deliver a poor picture, you are not going to be awed by the E15’s screen sharpness or brightness, either. The average build quality makes it way to the keyboard, which is backlit, feels OK to type on, and has a key travel distance which makes typing on the keyboard comfortable. Similar is the case with the touchpad which is responsive. Given the competition out there among children laptops, it was unsurprising for us to note that the E15 provides port variety. Apart from having usual, run-of-the-mill ports like USB 3.0, HDMI, headset, the thing that surprised us (in a good way) about this laptop was its USB-C port, which is not something we normally see in budget laptops. Given all the good features of the E15, its speakers hugely let it down. Adequate at best, they can get quite loud like a China mobile but, at full volume, their sound becomes more of a noise. Add to it the mysterious absence of bass, and one thing which we won’t recommend doing with this machine is hearing songs. One notable feature: MU-MIMO technology is on offer with this machine. As router enthusiasts might tell, this technology all but guarantees stunning internet speed on any device, provided you have a router which supports it as well. For the price, the 1TB storage available with the E15 makes it look like a steal. This capacity is much more than what Chromebooks included in this review can manage, for most are restricted by limited amounts of flash memory. It means you won’t need to use the SD card slot provided on the laptop’s front to increase its memory. As for its processor, Aspire has equipped the E15 with a 2.4GHz Intel Core i3-7100U processor, integrated graphics, and 4GB of RAM. Kaby Lake, the CPU of this machine, is the latest to come out of Intel warehouses, so you’d be getting quality performance out of this device. All in all, while it won’t match the speed of Core i5 or i7 systems, this laptop would get the job done be it doing homework, browsing videos, processing word, opening spreadsheets, and similar tasks. Apart from offering solid performance, the Acer Swift 1 offers further silver lining with its battery timing. Providing just above 12hours in our test, the battery timing of this machine makes good of Acer’s promise of being able to last a full day’s work on a single charge. Subpar speakers and a small amount of flex in the keyboard are the two major shortcomings of the Acer Swift 1 highlighted by its users. Whether he is going to deliver a speech on a Model United Nations meeting or attending a full day at school, your child could carry this laptop virtually anywhere and no one would guess how little you’ve paid for the device. If anything, don’t let the cute, candy-hued exterior of the HP Stream 11 to fool you – for it has some serious computing specs inside. As for its price tag, well, it was an effort on the part of HP to lower its Windows laptop prices to better compete with Chromebooks. Your child would either love or hate the toy-esque look of the HP Stream 11; there won’t be any middle ground for him or her to stand on. For, it comes in a purple or vibrant aqua blue colors, with the shades covering everything from its touchpad to the grained cover, though fortunately the white keyboard is left out. Build quality, on the whole, is decent; the screen doesn’t have any flex though you would find some in the center of the keyboard tray. HP has also provided the Stream 11 with a nonskid button for easy desk placement. Equally important is the fact that the keyboard is full sized, with a useful top row of button keys for adjusting audio volume, airplane mode, and screen brightness. Provided you are using an HP laptop already, you won’t find any difference in the keyboard keys of the Stream 11, which is a good thing. The 11.6’’ display, which is restricted by a mere 1,366 by 768 resolution, would present a fine view as long as your child keep themselves centered in front of it and keep the brightness at its maximum. Conversely, if they move to one side, or the screen isn’t tilted properly, the absence of IPS technology would result in the blurring of images. Luckily, along with a minimal set of ports – which include USB 2.0 and 3.0, audio jack, HDMI, microSD and AC adapter, the HP Stream 11 has 802.11ac Wi-Fi for dual-band connectivity. It also has standard Bluetooth though we found the transfer rates to be a bit lackluster. The touchpad was pleasant to use and responsive. Your wrists would be particularly happy as you won’t have to press down too hard on the buttonless surface either to move files or to highlight texts as is the case with other, cheaper laptops. As for its sound quality, probably our expectations were too-low as we found the Steam 11’s music to be a bit, err, brilliant. Despite the fact that their position is at the device’s bottom front, the speakers provide a dynamic and full sound. And if your child is a music-lover, he could customize his audio preferences using the DTS Studio Sound dashboard provided on this device. If there is one feature of the Stream 11 which might be a deal-breaker for some, it is its storage. Built-in in the device is a paltry 32GB eMMC flash storage, however, there’s much more to it than what meets the eye. For, alongside this paltry storage is the Bonus of Office 365 Personal for one year, as well as 1TB storage in OneDrive for an extra $200. Not enough, I agree but compare it with Chromebooks which come in the same price spectrum, and this device works better. As for its processor, HP has integrated this device with Intel’s Celeron N3060 – which is a dual-core processor – alongside integrated graphics. Still, while the device is far slower than costly laptops, you could still amp up its speed – and storage – using a microSD card. During our battery test, HP Stream was able to last just over eight-and-a-half hours of usage, hence proving its sufficiency for a school day or a long flight back home. Due to the lack of IPS technology, the screen has a new viewing angle, which means you’d have to sit right in front-center for a better view. Also, the 32GB eMMC might be a deal-breaker for some parents. 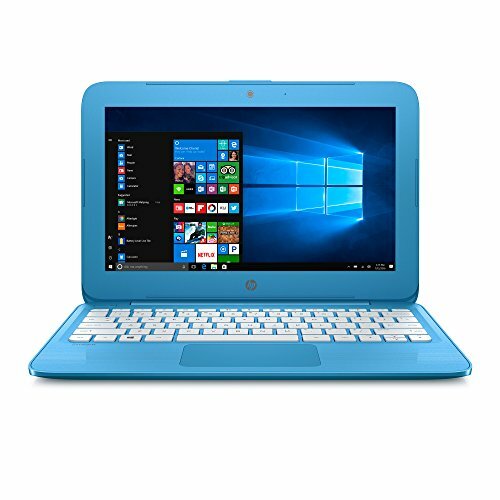 For those of you who want to gift their child a laptop in the first decade of their life – and who are sure that the child won’t take it with them to college, the HP Stream 11 has a limited but decent feature set to fit the bill. After taking a $900 million hit on the Surface RT – the predecessor of Surface 3, it seems Microsoft has learned its lessons as suggested. For, apart from being smaller and cheaper than its predecessor, the Surface 3 uses a full version of Windows and would run all Windows apps with ease. Use it as a tablet, and you’d find the Surface 3 to be a bit on the heavier side, but not without the additional benefits. Take its 10.8’’ screen, for instance, whose small size didn’t stop Microsoft from flooding it with an array of useful features. Microsoft has been able to retain the same 3:2 aspect for the Surface 3 as provided with the Pro 3. We found it to be a good amalgam between the 16:9 aspect of former Surface tablets and the iPad’s 4:3 ratio. Put simply, this ratio means that the Surface 3 would work just as well in desktop, as in landscape and tablet modes. While not as sharp as the iPad Air 2’s screen, the 213 pixels-per-inch screen (ppi) of the Surface 3 is still very good. Colors are realistic, and the screen is bright enough so that you could use it in harsh lighting, whereas its contrast is much more than what an average LCD screen could offer. That said, the screen had one obvious flaw, dynamic contrast. Active by default, the dynamic contrast system causes annoying changes in contrast and brightness whenever you’re watching a video. So it’s better to turn it off, though you might have to do some research as to how to do it as turning it off is not that straightforward. Use the Surface 3 on the table, and you’d feel like it’s different from any other laptop. For the typing enthusiasts out there, they could magnetically join the keyboard to the screen’s bottom to create a more favorable typing angle. That said, it also does well on typing when placed flat on a hard surface, such as your lap. One feature to note about the Surface 3 is the size of its keyboard keys, which are the same size as you’d get on the Surface Pro 3, so you won’t be compromising on them. They have a precise action and are comfortable to type on, though we are NOT comparing them with the market-favorite ThinkPad quality. What Microsoft has provided this model on the keyboard – usability – it seems to have taken away from it in the touchpad. Not only is the touchpad awkward – it is placed on the center-left instead of the center position which most of us a favor – but it is also small. It means you’d have to do very well to be precise about it. In the package of the Surface 3, you would get a very useful utility: an improved kickstand. Though it isn’t adjustable, Microsoft has provided the kickstand with three angles that work efficiently in a large number of situations. Our favorites were the shallowest and the middle angles, though you may disagree with us on that. 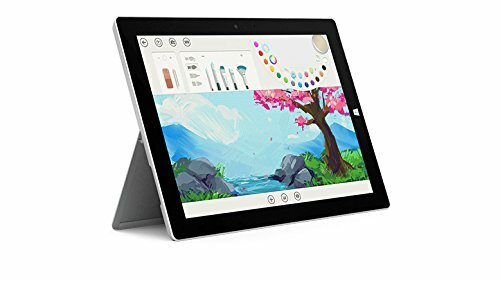 Microsoft is currently selling two versions of the Surface 3: the first with 4GB RAM and 128GB of storage, and the second with 2GB RAM and 64GB of storage. We’re testing the former as anything which runs Windows on 2GB RAM is bound to struggle. Thanks to its considerable RAM size, the Surface 3 would handle everyday computing tasks without breaking a sweat. We had no problems having multiple tabs open on the Chrome, while we were typing on MS word and music was playing in the background. And while its processor isn’t the best in business, it would play any game from the Windows Store without a hitch. This is good for parents as it would keep their children safe from unwanted, online games from unreliable manufacturers. Microsoft claims that with Wi-Fi turned on/off, the Surface 3 would last 10 hours, a claim which we found correct during our testing. However, if you use it for intermittent web browsing, video playback and things like that, the battery should last just more than eight-and-a-half hours. For a student’s laptop, probably Surface 3 is the only device which isn’t available in the under $500 range. It means you’d have to pay over the odds for its services. As its price tag might tell, the Surface 3 is not for every child out there. However, provided you could afford it, it would last with your child for years. 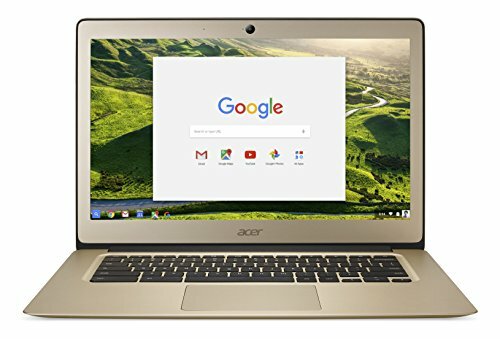 At first glance, you might mistake the Acer Chromebook 14 for MacBook Air, for it looks exactly the same. However, once you go past its Apple-esque design, you’d see that Acer has provided its customers with a budget-friendly treat. Integrated keyboard tray, rounded corners, and stylish, sharp edges make the Chromebook 4 look far more valuable than it actually is. Add to this the multiple metallic pieces which Acer has provided in its light-grey chassis, and your child would have a laptop that exudes class. Unfortunately, to take us back to earth, the lid would be enough. It looks cheap, and its brushed-metallic coating won’t complement the rest of laptop. And if that wasn’t enough, Chromebooks 14’s weight of 3.7lbs is surely a curveball as your child would notice its presence in their school bag. In case you were wondering, it is the screen of this device where Acer has employed some cost-cutting measures. Lacking vibrancy, its 1,366 by 768-pixel contrast is below average for Chromebooks. Luckily, thanks to the matte coating, you could use it in bright sunlight, though. As we’d see in the next section, both the hard drive and processor of this device are below average, to put it mildly. One area, however, where you cannot find fault with the Chromebook 14 is its wireless connectivity: it has the latest 802.11ac Wi-Fi, which means faster and more reliable connections. Chrome OS is another notable feature of this laptop as – with the recent tweak that Google has carried out – this OS is able to run apps directly from the Google Play Store. It means that whether it is Adobe Reader or Temple Run, your child would find everything on this device. The best feature of the screen is its ability to provide brilliant colors while lying completely flat. It means that it would be comfortable working on the Chromebook 14 on your lap in bed. As for its 720p webcam, it offers a mixed bag as, while at one end it provides a good low-light response, it also over-exposes things in a brightly lit room. Since it would be using the Chrome OS, you would get to choose between 32GB and 16GB of local storage, which would be just enough for a small number of downloads. However, if something heavy comes on the way, a subscription to Google Drive or Dropbox might be required. As for its performance, the Chromebook 14 houses a low-power Intel Celeron N3060, which is essentially a dual-core processor. The processor is supplemented with 2GB of RAM, which we could all agree is nowhere near enough for multiple media-heavy tables open at the same time. All in all, if your child is a heavy Internet user, Chromebook 14 might not suit him. However, if he’s yet to explore the internet, the speed restrictions posed by this device would be just enough. Do a full day of work, add in a bit of relaxation time, and still, the Chromebook 14 would have juice left in it, thanks to its extremely impressive fourteen-hour battery timing. Despite the fact that its 32GB storage is nowhere near enough, the fact that Acer hasn’t provided the Chromebook 14 with an SD Card slot – so that one could increase its memory at will – seems a bit inexplicable to its users. Offering almost 14 hours of battery timing, a metal body, and a stylish design, the Acer Chromebook 14 presents all the features and niceties which you expect from a basic laptop. What’s the Right Age for Giving Your Child a Laptop? One of the most heated debates among parents of young children is about the age at which their children should be allowed to have their own laptop. And with the advent of Chromebooks – which allow children to download and play games from Google Play store, the decision has become extremely difficult for new parents. Unfortunately, there is no hard-and-fast age at which every child needs a laptop. So, you need to ask these questions before giving your child her first computer. Imagine you’re sitting around your dinner table, and your little one brings up this subject of getting their own laptop. You could respond in one of these two ways: either you could shut them down citing their tender age, or you could query them about the reason they think they need a laptop. If you ask us, go to the second path. Ask your children. Is their school asking them to have a laptop? Do they want to see movies on it? Do they think they could get help with their homework? Only after listening to their answers should you make your decision. There are loads and loads of studies showing the positive impact of conversation on the development of a child’s brain. In other words, the more you talk to your children, the better their brain develops. Period. Therefore, before giving them the laptop, make sure your child is emotionally mature. One of the signs of being emotionally mature is that they know when, how, and who they can ask for help. Another sign is that they aren’t throwing tantrums when they don’t get the thing they desire. Afterward, once you have given them their laptop, fix their onscreen time so that they don’t forget to interact with the world. As NY Times tells us, parents should tread the waters before handing a laptop to their child. In simple words, start your children with a laptop on which there is no chance of anything going wrong. For instance, you may disable the Wi-Fi drivers if you think that your child isn’t mature enough to go online on their own. Once again, it is where the Windows 10 S – which has recently been converted into the Windows 10 S mode, comes into play. Streamlined for security, this mode makes it next to impossible for your child to access something on the internet which is not made for him to see. Finally, once you have bought them the laptop, make sure you introduce them to age-appropriate websites and spend time with them while they are online. In this way, without being too intrusive, you might draw the boundaries of the internet for your child which would ensure that they remain safe online. With so many options out there, how would you decide which laptop is the best for your child? Do you want more memory, or is a big hard disk important? Is Windows the only operating system, or should you decide in favor of Linux or Chromebooks? To get answers to these and similar other questions, read on. Since everybody would tell you to consider your child’s age, it might seem silly for you to hear the same from us. Still, age is a huge factor when buying a laptop for your child. For instance, youngsters have smaller hands than the elders so they require a laptop scaled to their hand size. Lavish laptops like Dell Inspiron 15, 3000 series are bad laptops for children not because they have poor computational power, but because they are too large to fit any kid, and also too expensive, which means going for them would be a waste of money. Thus, most children need a laptop which has a smaller screen (say between 11’’ and 13’’), which you won’t like having on your office desk. These laptops won’t have all the features in the world, but they would suit your child. You know what transforms an ordinary laptop into a school-friendly device which your kid won’t destroy or outgrow in a few months’ time? Yup, its build. And I’m NOT talking only about the lid, which is also important, but things like a keyboard should also be rugged in a kids’ laptop. For example, several inexpensive Windows laptops, as well as Chromebooks, offer spill-resistant keyboards, which means they could withstand an ounce or two of water without damaging the internal hardware. However, you shouldn’t go looking for waterproof keyboards since their price tags take them away from the kids’ laptop category. As for the lid, make sure that it is either reinforced with another material or has a case made of rubber so that the laptop could withstand drops from a few feet. Especially if your child is a middle or high-schooler – who have their bags stuffed with heavy textbooks, you need to give them a laptop which doesn’t add to their backpack’s already heavyweight. Apart from going for screen size between 11’’ and 13’’, an ideal kids’ laptop should weigh about 2.5pounds. Increase the weight above 3pounds, and you are just unnecessarily increasing the weight on your child’s shoulders. Still, if you can’t find a lightweight laptop, make sure to go for one which offers a carrying handle. In this way, kids can bring them to school without stuffing them in their backpack, or visit their lockers. Want to make your laptop-hunt easy? Consult the teachers of your child about the laptop they think would suit him the best. Since they have been dishing the same advice to parents for years, teachers are experts in the laptops which suit children of a specific age the best. Once you hear their recommendation, DO NOT just buy a laptop which merely meets the specs. Instead, go for one which exceeds those specs just to make sure the laptop is future-proof. 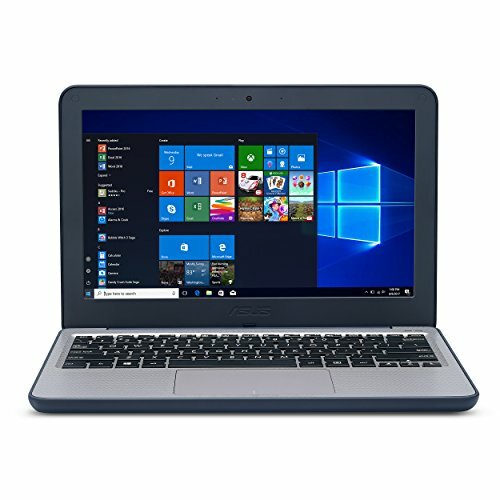 Setting for a cheaper, below-par laptop which barely meets the specs mean that in case any new software is included in your child’s syllabus, they might fail to participate. Once you have heard the recommendations of their teacher, ask your child what they would do with their laptop. Would they like being online on it or are they going to use it only for school assignments and homework? It would also be wise to ask them their favorite games so that you could later compare the requirements of the game with the specs of the laptop. Finally, the type of software which their school – or they – intend to run on the device should also be known to you. Choose a laptop whose screen size is between 11’’ and 13’’, has either Windows or Chrome as its operating system, which doesn’t cost more than $500, isn’t touchscreen, has a spill-resistant keyboard and doesn’t weigh above 3kgs. If you aren’t an IT expert, you, like most parents, might not know the ins and outs of a particular laptop, let alone what differentiate one from the others. Therefore, when buying a kids’ laptop, these are the specs you might want to look for in them. A computer’s processor is its brain, its central processing unit. It takes all the instructions which the users give before translating them into actions. The more powerful a processor is, the faster it would execute its functions. Most laptops designed for children can do with a typical, not-so-expensive, Core i3 processor, which is more than capable of running the basic programs your child may want to use. You don’t need to waste your money on a heavy duty processor such as Intel ATOM or Core i7 as most programs designed for children would easily run on the Core i3 processor. Also known as the ‘memory’ of the computer, its storage is that part where your child would store their homework, assignments, videos, pictures, games etc. Therefore, anything between 320GB and 500GB storage should be enough. Remember, gone are the days when computers had a fixed memory, one which we cannot increase. Nowadays, if you think your child needs additional storage, you could purchase a portable hard drive which would be used alongside the main storage drive. Since youngsters’ laptop need not be expensive, a screen size between 11’’ and 13’’ would be enough for them. One factor most parents often end up overlooking while choosing a laptop for their child is the machine’s screen size. Measured diagonally from one corner of the screen to the other, a screen size also has a huge bearing on the final price of the laptop, with smaller screen laptops obviously costing less. Like other specs which you may want to consider, battery life is crucial, too, though most modern laptops provide it as a given without charging anything extra. Even the cheapest laptops out there provide as much as four hours battery timing, which should be your lower limit while choosing a kids’ laptop. As for connectivity, it is the mechanism with which the laptop would connect to the Wi-Fi, and there are two such mechanisms: 2.4GHz (single-band) or both 2.4GHz and 5GHz frequencies (dual-band). If you have a modern router in your home, chances are that it provides dual-band connectivity, which means that it provides more speed and a stable connection than a single band router. That said if you don’t want to unleash the internet on your child, go with the slightly slower 2.4GHz or single-band supporting a laptop. Now that you’ve looked at the specs and features which are considered as a must-have for any children laptop, let’s turn our attention to the features which, apart from increasing the price of the model, won’t contribute much. Most children would need a pretty basic set of productivity tools – spreadsheet manager, presentation builder, and a word processor – to handle their school homework or assignments. The good news is that you don’t have to purchase MS Office, as Microsoft Office 365 is available for free for education purposes. For, Microsoft is currently offering its suite free of cost to both teachers and students; all your child needs is a valid school email address to download it. Failing that, Office.com, as well as Office apps for iOS and Android, offer free versions of the MS Office with all basic features enabled. These basic features are enough for writing term papers, making presentations, and the like. What’s more, if the school doesn’t require your child to use MS Office, use Google docs, which is absolutely free and offers all the features of an MS Office suite. Ever since Windows introduced Windows 10 for laptops – with its intuitive collection of apps on the welcome screen – touchscreens seemed to have become vogue in laptops. Still, for kids’ laptops, we recommend NOT taking the touchscreen bait. For, in addition to making the laptop more expensive – as Dell requires you to pay $350 extra for touchscreen on its XPS13, touchscreen laptops often fare worse at the battery-timing count, which means their non-touchscreen counterparts lasting longer in one charge. And if that wasn’t enough, touchscreen laptops also weigh more. Need proof? Go check the EliteBook Folio G1. Without touch, this laptop weighs a paltry 2.14 pounds, but the induction of touchscreen takes its weight north to 2.26pounds. Lastly, if your children are going to do homework or make assignments on their laptop, it goes without saying that typing on a touchscreen is much difficult than typing on a keyboard. And even if they don’t find it that way, most school labs have computers with keyboards for typing. So, by going for touchscreen, you’d be making their life difficult. Even when the laptop that you buy for your child isn’t immensely powerful, that would still offer him or her a window into the unexpectedly powerful internet. So, it is your duty (and that of their teacher’s) that the device doesn’t prove harmful. Fortunately, if you are going for the Windows operating system, it would have the built-in parental control features regardless of the version of Windows that laptop has. All you need to do is to activate them to make sure your child remains safe online. To activate parental control features, open the control panel of your Windows and select the Parental Controls Icon. If you cannot find it, just type “Parental Controls” in the search bar. Once you have found it, click on ‘’Set up parental controls for any user’’. Afterward, the screen would show you the list of user accounts, provided there are more than one. Select your little one’s user accounts, and click ‘’On’’ to activate Parental Controls. You could adjust settings such as ‘’Time Limits’’ which would allow you to limit your child’s computer usage. Similarly, it features options for game control and for safe internet browsing. Once upon a time, laptops came with built-in hard drives, those which you could not increase on will. Thankfully, those days are past us now, which means we should focus more on speed (processor) than on size (storage). Since this would be your kid’s first ever laptop, they won’t be needing as much storage space as, let’s say, YOU! And even if you want your laptop to be future proof – which means that you want it to last longer – there is always the option of adding on a Solid-State-Drive (SSD) or external hard-disk-drive (HDD) later on. Therefore, if you want to save money, please DO NOT purchase a 1TB storage drive when 320GB would suffice. Look at the list of the ten best laptops for children, and there is hardly a device whose price tag seems astronomical. What’s the reason? Remember, even the best laptops for children come below the $500 price tag, so you don’t need to spend extra. You won’t have to break the bank to purchase them, and their lower cost also doesn’t mean that these laptops would operate slowly or are poorly made. Instead, since their focus is always on the younger kids, they take out some features which are not considered helpful for their age group and compensate for them by lowering the price tag. So, if someone asks you to spend over the odds on a kids’ laptop, decline their invitation.